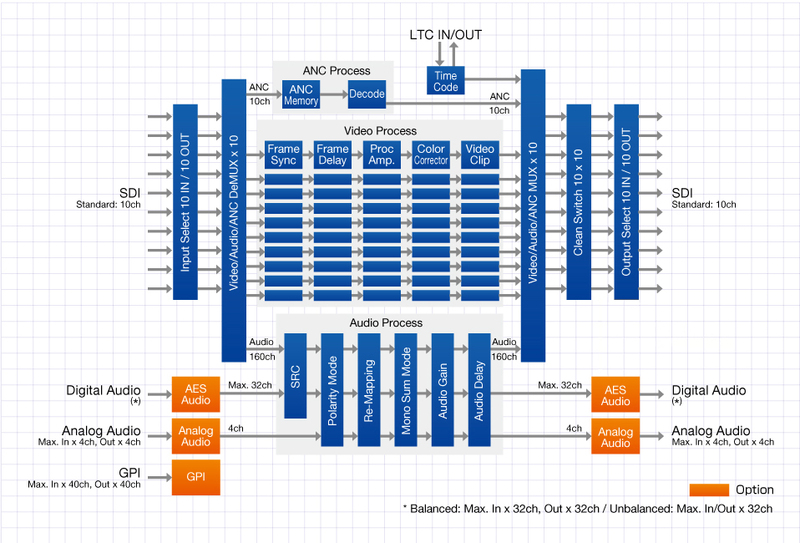 A frame synchronizer equipped with the various functions you need for video production and that enables multi-channel routing (10 video I/O). 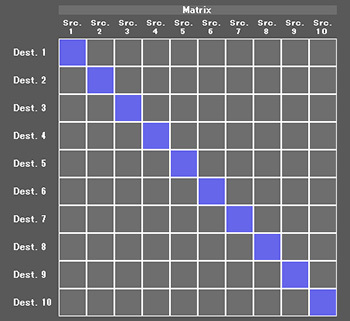 Frame synchronizer equipped with an array of essential functions used in video production and that allow multi-channel routing (10-input/10-output video). Supports 3G-SDI and HD/SD-SDI input/output as standard and includes all typical FS and CC (standard) features. Highly versatile audio signal processing capability with delay adjustment and remapping functions plus a sampling rate converter. Combining these varied options allows a single unit to provide optimal functionality for all video production scenes, including those used in transmission, outside broadcasting, news reporting, production, editing and distribution. 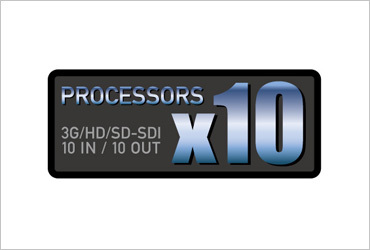 The FA-1010 is not simply 10 processors enclosed in a single housing, but 10 interconnected internal circuits. It implements all the various processors and clean switch functions required to build a system, and enables multi-channel signal processing on each channel with no cable connections. In addition, as ancillary and audio signal data are handled separately from video signals, concerns about ancillary data such as subtitles and time codes being erased can be allayed. With 16 channels of 3G/HD (synchronous/asynchronous) and SD-SDI*1 (synchronous) embedded audio on each input supporting up to 160 channels on all 10 inputs, a versatile array of signal processing is possible, including standard SDI embedding and de-embedding, and if an optional expansion card is installed, A/D and D/A conversion. The analog audio input option is equipped with a microphone head amplifier and phantom power, enabling direct condenser microphone input with no need for impedance conversion. 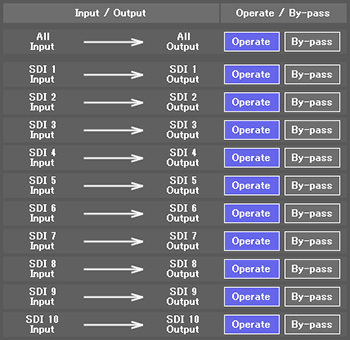 The unit also includes sampling rate converters as well as various other processes such as level adjustment, delay adjustment, down-mixing*2, remapping, and polarity conversion. 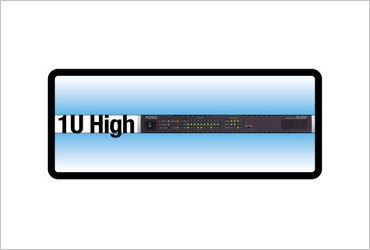 With the capability of 10 processors fit into a 1U size, the FA-1010 provides a smaller equipment footprint. In addition, it is perfect for systems that handle a large number of inputs and outputs, such as network operation centers, and systems where equipment space is limited, such as mobile video production trucks. In addition to proc amp., the FA-1010 incorporates a color correction function, allowing color correction to be performed in three color correction modes, which offer a flexible color adjustment environment that includes gamma adjustment, clipping, and various level adjustment functions. 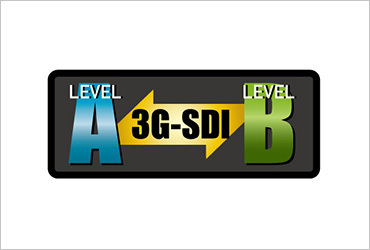 Connectivity difficulties can arise when building a 3G-SDI system that mixes level-A and level-B-compatible products. The FA-1010 allows a system to be assembled that unifies the signals of either kind, with level-A/B input signals inter-convertible on each channel. The FA-1010 comes standard with 10x10 video and audio clean switches to route the ten output SDI signals after processing. To cope with a power outage or emergency, the FA-1010 includes an I/O bypass function. 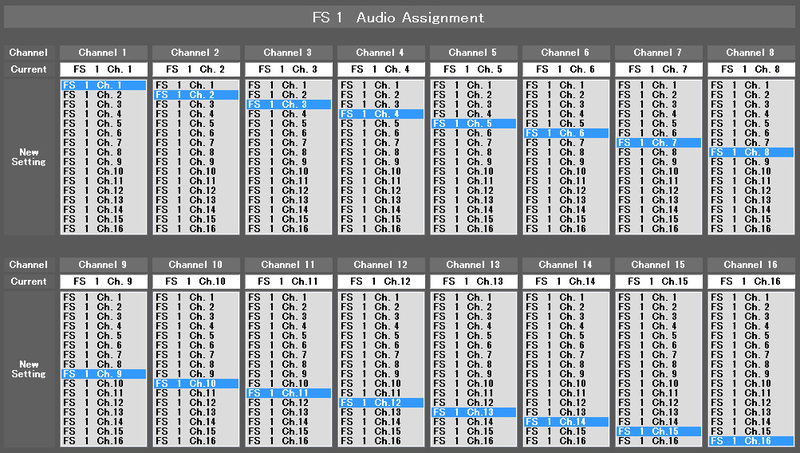 You can remap which audio signal channels to assign to each video or each audio channel. 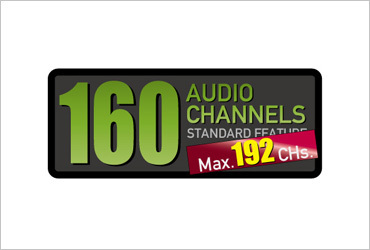 Up to 160 channels of audio signal can be freely re-mapped as standard, or up to 192 channels when optional cards are installed. Delay adjustment and polarity conversion are also available on each channel, allowing systems to be configured without any special audio processing equipment. A video channel link allows you to collectively control channel parameters you want linked. 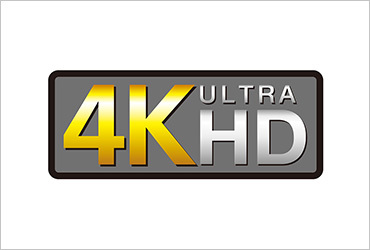 The FA-1010 offers a special 4K mode that uses this capability. 4K (QFHD) square division signals can be controlled as if they were one signal. The FA-10RU remote control unit provides dedicated access to the full features of the FA-1010 and can control up to 100 FA-1010s. 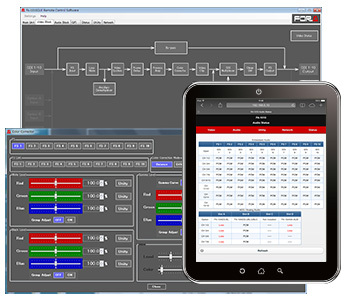 One FA-1010 is also able to be controlled from multiple remote control units or GUIs at the same time (with up to ten concurrent connections possible). The FA-10DCCRU remote control unit for color correction has inherited the traditional operating style of FOR-A's color corrector series of products and offers direct access to a variety of parameters for smooth color adjustment. 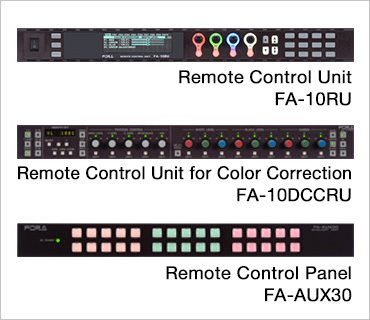 The FA-AUX30 remote control panel facilitates access to the rich functionality of the FA-1010. Its switch box works over a GPI connection and can be used to freely assign router panel button functions to the 30 front panel buttons, and to assign shortcuts for each function. In addition, preset patterns are prepared in advance in the GPI settings, allowing you to begin using the FA-AUX30 immediately, with no detailed configuration required. The FA-1010 comes standard with a dedicated application that runs on Windows, providing full access to many functions, and allows a wide variety of settings. Web server functionality is also implemented in the main unit, allowing adjustments* to be made to various parameters from mobile and tablet devices. This feature is available for a limited number of function and parameters. 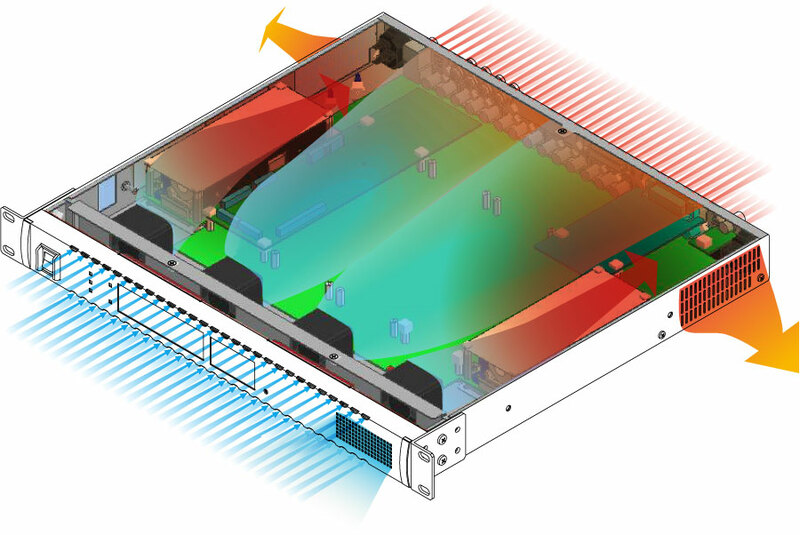 The FA-505 is designed to offer efficient cooling during extended use. Air that is taken in through the front panel inlet holes cools the inside power supply and other components, and is exhausted through the side and rear panels. The air intake is pulled straight through the inside and out the exhaust vents for efficient cooling, reducing retention heat throughout the whole unit.